If you enter St. Wystan's Churchyard by the lych-gate and walk down the path towards the church, before you reach the south porch, turn right and go up to the stone wall and look at the headstones against it. 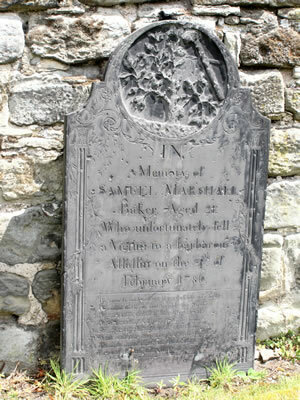 One slate memorial is dedicated to a Samuel Marshall, aged 21, who was murdered in 1786, whose killer was caught but acquitted at trial for the lack of witnesses. For God is just and will avenge my cause." If you examine the headstone, you will see it depicts a tree with five branches, one of which has been cut off with an axe, representing the dead man, and the others his surviving brothers. A nearby gravestone is that of Samuel's grieving father, who died in the following year. "A most shocking murder was perpetrated on Saturday evening last, on Samuel Marshall, a baker, of Repton. He was upon his return with an empty bread-cart, having delivered his bread and cakes, etc. at several villages, and particularly at Rolleston (the next day being Wakes Sunday at that village). He had received cash, it is said, to the amount of six or seven pounds, and was making the best of his way home when his career was suddenly stopped by some villain or villains unknown. "He was found about seven o'clock by one William Mountford, a labouring man, of Ticknall, who was passing by and saw the unhappy youth lying on the ground near the Navigation Bridge at Willington*, and his body mangled in a frightful manner. "He had received a violent blow on the head, and also a deep cut behind the left ear, which seems to have been done with a pen-knife or some sharp instrument. They had cut his throat in such a manner that a piece of his flesh hung down to his chin, but had not penetrated his windpipe. His pockets were turned out, the contents taken. "As soon as possible the neighbourhood was alarmed, the body removed to Repton, and a warrant, and a hue and cry issued by a worthy magistrate. Persons were despatched to search the most suspected places. "Handbills were printed and dispersed (offering a reward of £40 over and above what is allowed by Act of Parliament), and every means used to bring the perpetrator of this inhuman deed to condign punishment. But, notwithstanding that several have been taken up on suspicion, yet after examination they have been discharged, nothing substantial appearing to incriminate them. [A few days later the Derby Mercury reported] "On Thursday night, about ten o'clock, a young man named James Wheldon, of the village of Rolleston, near Burton-on-Trent, was brought to the county gaol, charged on a violent suspicion of having committed the murder near Willington, on the body of Samuel Marshall, baker. "He, that day, underwent an examination of about eight hours before Sir Robert Bardett [Burdett?] Bart. (one of His Majesty's Justices of the Peace), when a very minute enquiry was made, and that with the strictest impartiality, and it appearing by many corroborating circumstances that the above young man might personally be suspected of perpetrating the horrid deed, he was committed for trial at the next Assizes. "One particular we must not omit, which is that a blacksmith's hammer was found near the spot it was perpetrated in, having, it is supposed, been the instrument used on the barbarous occasion, and had been thrown over the hedge immediately after the murder. 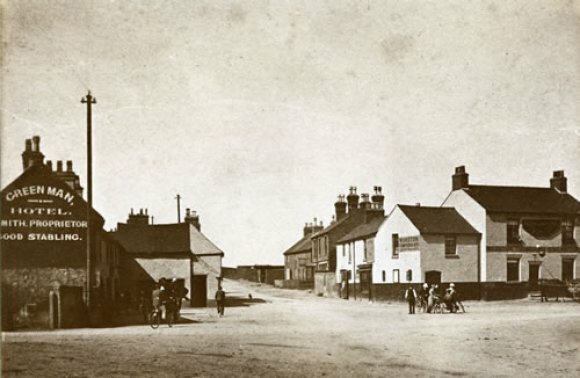 "On the discovery of his hammer, several persons were despatched to Rolleston, and upon enquiry the blacksmith missed the hammer, and afterwards it came out on the oath of this man that he had lent the hammer to Wheldon several days previous to the murder. This circumstance the prisoner positively denies, saying he never borrowed a hammer from him in all his life. There are several other circumstances incriminating him but how far they may weigh in the views of a jury, time only can determine. ["Derby Mercury": March 23rd, 1786] "James Wheldon, charged with the murder of young Marshall, baker, of Repton, was acquitted after a hearing of nearly six hours." Unfortunately there is no account of the trial itself. In his 1971 article in the "Derbyshire Advertiser", the late Mr.H.J.Wain wrote: "The story has been handed down that the prisoner was acquitted largely due to an alibi in his favour sworn by a young woman he was about to marry, and also the refusal of the blacksmith to confirm his previous oath as to the identity of the hammer found near the scene of the crime. The young woman lived at Barrow-on-Trent and, on the evening of the trial she set out to meet a friend returning from Derby with news of the result. On hearing that Wheldon had been acquitted, she 'manifested the wildest fury, her shrieks and cries betokening the influence of insanity. At last, having uttered one of the most appalling maledictions that ever escaped human lips, she sank into a state of insensibility, which lasted for at least four hours.' "
According to another account, the suspect was seen in after years to visit the spot where the crime was committed, and also the churchyard, to gaze upon the gravestone of his victim. This account goes on to relate: "Some time afterwards, Dr.Chawner, of Repton, an eminent practitioner, who had given evidence as a medical witness at Wheldon's trial, and whose evidence bore strongly against him, was called upon at a late hour on a dark and tempestuous night, by a stranger, who requested him to visit a patient whose name he had not before heard, and who resided at Measham, near Ashby-de-la-Zouch, and whose case was said to be one of extreme urgency. The doctor got out his gig and with the stranger as his guide, undertook the long journey. He arrived at the village in due course, and was admitted into a house, where in a bed, surrounded by drawn curtains, on the ground floor lay his patient uttering loud and frequent groans. On pulling back the curtains the doctor beheld to his amazement, the distorted features of the accused, assassin of Samuel Marshall. He feared at first he had been decoyed, and it was the intention of the sick man to exact revenge on him for giving evidence at his trial. But it was soon evident that Wheldon had no such intention, and indeed was alarmed by the appearance of the doctor, who had been hastily summoned by a neighbour without Wheldon's knowledge. Dr. Chawner, after various attempts to give relief to the sufferer, gazed at him for some time, while a series of awful sensations passed through his mind. The solemn hour of midnight, the raging storm with vivid flashes of lightning, and deep bursts of thunder, the presence of a suspected murderer with what appeared to be a final and mortal struggle, with a rapidly approaching end, impressed upon the mind of the contemplator a picture of the terrible destiny that awaits the evil-doer. So runs an imaginative account of the illness of James Wheldon some time after he had been acquitted of Marshall's murder. Unfortunately, it is not known when or where he died, or why a medical practitioner living in Repton should be called upon to attend an unknown patient residing in Measham. But the curse, written on the headstone of Samuel Marshall in the Repton churchyard by his grieving family, seems finally to have struck down his barbarous assassin, who, having managed to escape the hangman's noose, suffered a dreadful death.